Noted pharmaceutical and healthcare service provider, Green Light Healthcare, was celebrating last night after being awarded the Innovation of the Year Award by the BBC’s Martine Croxall at this year’s UK Employee Ownership Awards. This award celebrates the most compelling example of innovation within an employee owned organisation that enhances the services or products of the business, and the outcomes the business achieves. 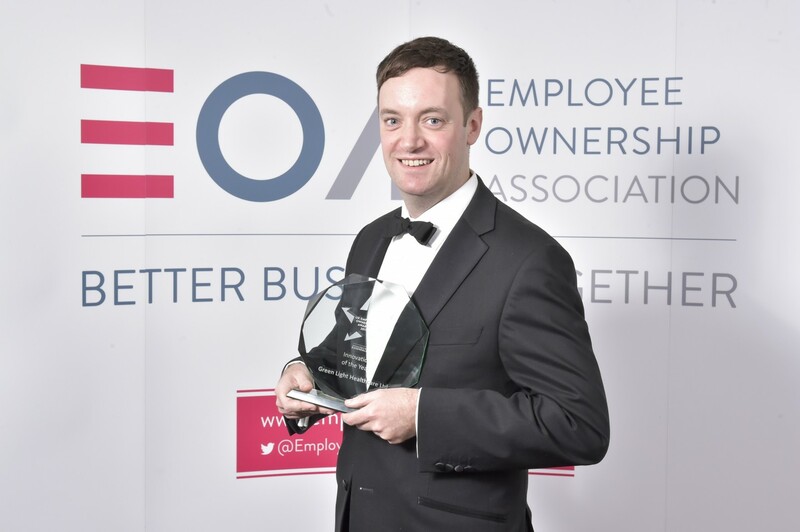 Sponsored by employee ownership transition specialists Baxendale and managed by the Employee Ownership Association (EOA), the UK Employee Ownership Awards are the most prestigious accolades for employee owned organisations. Formerly the Philip Baxendale Awards, this year’s awards were presented at the Gala Dinner on the first evening of the EOA Annual Conference at the Hilton Birmingham Metropole Hotel. An independent group of judges from the employee owned sector highlighted Green Light Healthcare’s ingenuity in converting the unused basement of their pharmacy in Euston into a teaching pharmacy, with real medicine and real patients. Partnering with University College London’s School of Pharmacy, this evolved into a live teaching pharmacy which allows students on the pharmacy degree to spend structured group teaching placements talking to patients, practicing delivering real pharmacy services and learning in a real community pharmacy environment.